Earth Day is just days away. 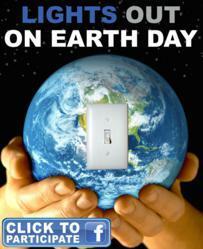 Take the ‘Lights Out’ pledge presented by 4AllPromos in observance of this important day. 4AllPromos has already pledged $1000 but the goal is to reach $5000. Help make a difference by taking the ‘Lights Out’ pledge on Facebook today! It’s the time of year to re-examine what you do for the planet on a daily, monthly or annual basis. 4AllPromos, a promotional products company in Essex, Connecticut, is asking customers and friends to pledge to turn the lights off for 5 minutes at noon on April 22nd and let 4AllPromos know what you are doing to help the planet. To take the pledge, simply ‘Like’ 4AllPromos on Facebook. For every ‘Like’ 4AllPromos receives they will donate $1 to Earthday.org, a world-wide organization dedicated to improving the environmental movement on a local, state, national and global level. Earth Day is just days away. Take the ‘Lights Out’ pledge presented by 4AllPromos in observance of this important day. 4AllPromos has already pledged $1000 but the goal is to reach $5000. Help make a difference by taking the ‘Lights Out’ pledge on Facebook today! It’s the time of year to re-examine what you do for the planet on a daily, monthly or annual basis. 4AllPromos, a promotional products company in Essex, Connecticut, is asking customers and friends to pledge to turn the lights off for 5 minutes at noon on April 22nd and let 4AllPromos know what you are doing to help the planet. To take the pledge, simply ‘Like’ 4AllPromos on Facebook. For every ‘Like’ 4AllPromos receives they will donate $1 to Earthday.org, a world-wide organization dedicated to improving the environmental movement on a local, state, national and global level. 4AllPromos cares about the environment that is why they carry a large assortment of earth friendly products including recycled tote bags and sticky notes, organic cotton apparel and other giveaways including fly swatters, chip clips, water bottles all made from recycled plastic. The ‘Lights Out’ campaign has been extremely successful in promoting the significance of Earth Day as well as the variety of earth friendly products available on the market and through 4AllPromos. The pledge is so easy to take. Turn out the lights for five minutes at your office, school, dorm room, apartment or local hot spot to show you care about the planet. Little by little we can all help reduce the impact of the carbon footprint and improve our communities by making them safe and healthy places to live. The ‘Go Green’ movement has grown increasingly popular in the last several years and so has the demand for earth friendly everyday products. Plastic grocery bags pile up in landfills and can be harmful to animals. Tote bags made from recycled plastics are a great alternative. Reuse tote bags over and over and they fit more than your average grocery bag. Recent research has shown that some water bottles contain a compound known as BPA (Bisphenol A) which has some negative health effects including cancer, obesity, thyroid issues and some concern of effects on fetal and infant brain development and behavior. Although not all the research is conclusive many companies acted on the concern by producing BPA free water bottles. These bottles can be used over and over, are dishwasher safe and can travel anywhere. Earth friendly products are great giveaways for non profits, schools or event planners. These kinds of promotional products are a hit at expos, trade shows, concerts or festivals. Customers will appreciate your efforts to go ‘Green’ and these products will help them make a difference in their own environment. Earth day is Friday. Help spread the word to friends, family or customer’s about 4AllPromos ‘Lights Out’ challenge on Facebook, Twitter or by word of mouth to help them meet the $5,000 goal. It’s so easy to do and Earthday.org will pay all pledges forward by creating outreach programs, environmental legislation and other movements to help make our earth a better place to be.